Today is Charli’s first birthday! 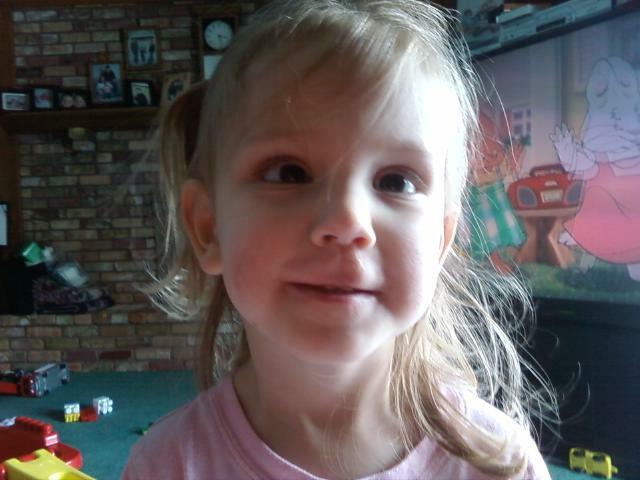 I can hardly believe that its been that long since she was born. It really feels like yesterday that we were going through the whirlwind of her birth and the complication during and after. 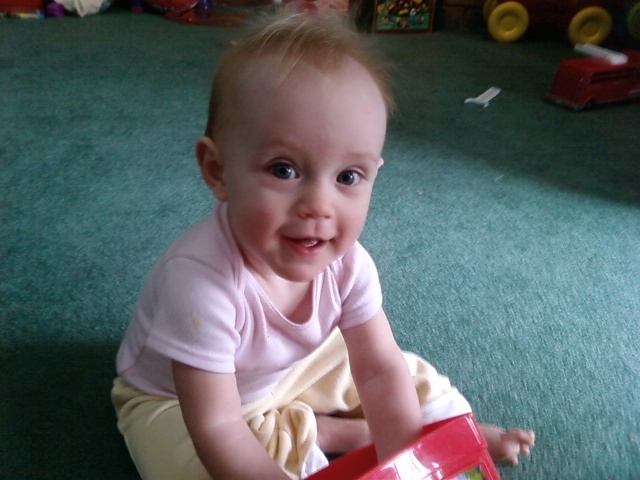 It is just so crazy to me that now she’s a perfectly happy, healthy, and gorgeous one year old. As with Tori’s birthday post, this is more for my own record keeping- so if this disgusts you to read details, do me a favor and spare me your complaints- no one’s forcing you to read this. And just a forewarning- its SUPER long! We decided to try for Charli in the summer of 2007. Dave and I had gone through some pretty rough times with life and family and we felt stronger than ever as a couple, and that it was time to think about another little munchkin. A few of my friends had talked about how hard it was to get pregnant with the 2nd and so we figured we’d start trying and in about 6 months we’d be pregnant. It took me a little while(5 months) to get pregnant with Tori, so I figured it would be the same. Not so. Three weeks later we were announcing another one was on the way! The first people we told were Geoff and Jill, Dave’s brother and his wife. It was actually the night before their wedding that I took a test and it was positive. We let them know at their reception, but decided to wait until the next day to tell anyone else. On our way out from the reception Dave said something about needing to go and get Tori in bed and Dale said something like, “Get Tori in bed or someone else?” We never quite understood that, but it seemed he had a sneaking suspicion. I called some close friends that night and they were ecstatic! The next day was Sunday. Dave’s cousin was speaking in church and so we went with his whole family. Dave made a couple cards that were to Grandpa and Grandma that Tori was going to get out and give to them at church, stating that she was going to be a big sister. As expected, Dave’s mom started crying, and his Dad had what Dave calls, ‘The Proud Smile” on his face. We told my family over the phone, as they live far away. This is what Tori looked like when I was first pregnant with Charli. The pregnancy started off ok, but quickly I realized a lump in my stomach that caused terrible heartburn and was pretty painful. I went in to my regular doctor and she had a scan ordered and sure enough, as she’s suspected, it was a hernia. We visited a surgeon who explained that for obvious reasons surgery, and opening the body up during a pregnancy, is not ideal and that unless it was life threatening, they would only do it around 15-18 weeks if the pain was unbearable and it was causing complications. 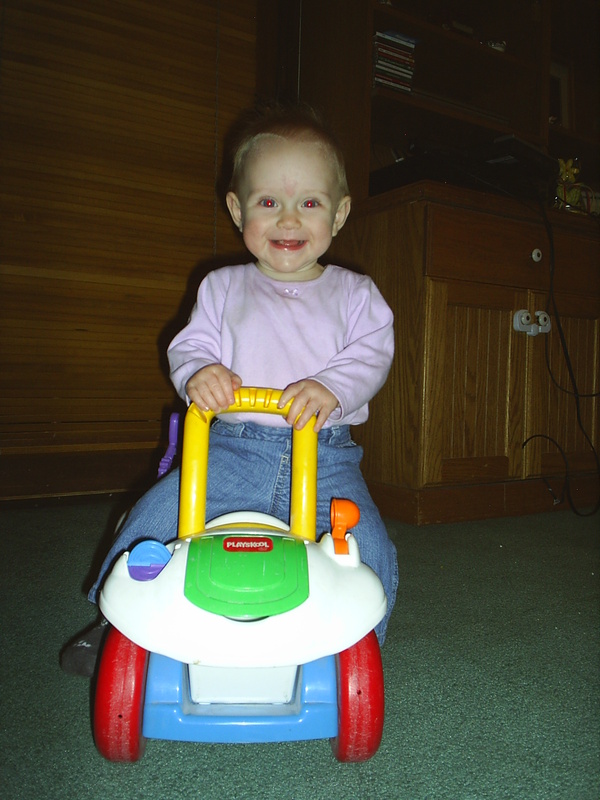 A few weeks later at about 17 weeks, I was going in for surgery. The hernia continued to cause problems, as well as rapid weight loss, as I could not keep anything down, and even water would give me heartburn so bad, I’d throw up again. It was not fun. The surgery went fairly well and afterwards they were able to have someone come in and check the fetal heart tones to make sure my baby was alive and doing well. The surgery itself was possibly one of the oddest experiences of my life. I’d been through a c-section, where you’re awake and you can hear the doctors talking about slicing you open, but there’s a tangible human being at the end that you get to hold and cuddle and love that makes it worth it and keeps your mind distracted from whats really going on. The anesthesiologist and surgeons had decided that the safest option for anesthetic would be a spinal block. Talk about weird. They used a cauterizer, so I’m laying there, smelling my own flesh burning, and listening to them the whole time. It was definitely something I’d rather not experience again-EVER. The recovery was difficult. My mom came out for a 6 days, but after that I was on my own. I was told to not lift anything over a gallon of milk- about 5 -10 pounds. 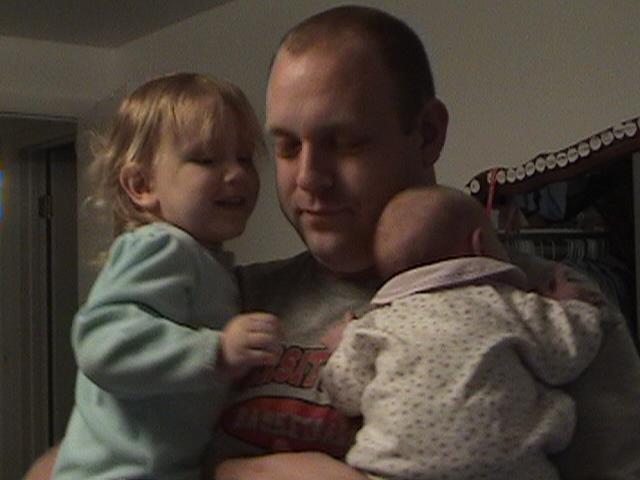 Tori was nearing two, so obviously over 10 pounds. I’m regretful to say that it was not possible to follow those instructions. The hernia came back out in mid January and I had to deal with it the rest of my pregnancy, which was miserable, especially later on when Charli could kick it out on her own! 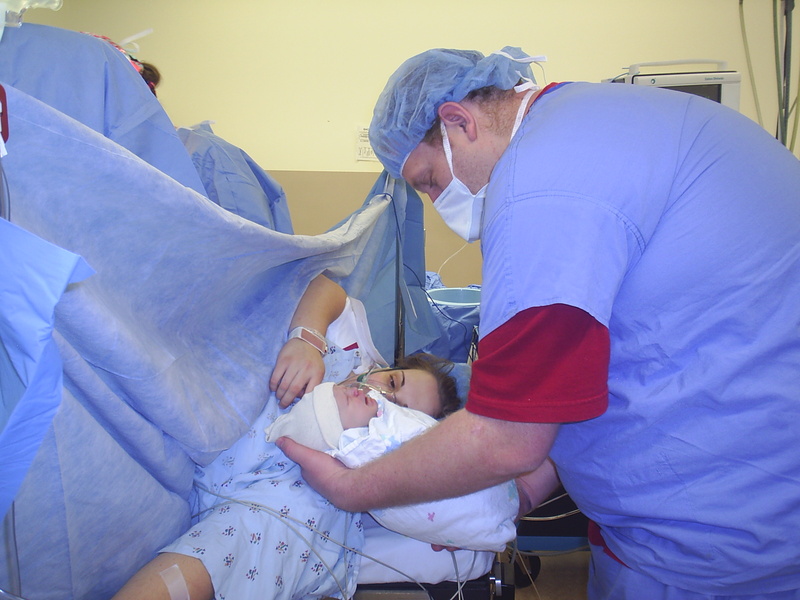 About a week before surgery I had a nightmare I was in a car accident. I’d never been in any car accident, other than a minor fender bender, and certainly never caused one myself! 5 days before surgery, I was coming home from picking up some pregnancy books. I was not familiar with the intersection and found myself sitting perpendicular to traffic, in about 3 lanes, with a small truck coming full speed at us. Tori was with me and we were very lucky it was not a lot worse than it was. We had some angels watching over us that day and thankfully, no one was hurt. I had some whiplash and a few other minor things, but thats about it. An ambulance came and kept asking me to ride with them to the hospital, but besides the whiplash and a small bump on my head and sore hips, I felt alright. I did NOT want to ride in that! I called my mother in law Rose and she came and got Tori and I and took us to the hospital. It was quite a day. I spent about 6 hours being checked out, as well as the baby, and needless to say, was exhausted by the time we got home. It took nearly 2 months for our car to be fixed, and sadly its never been the same! 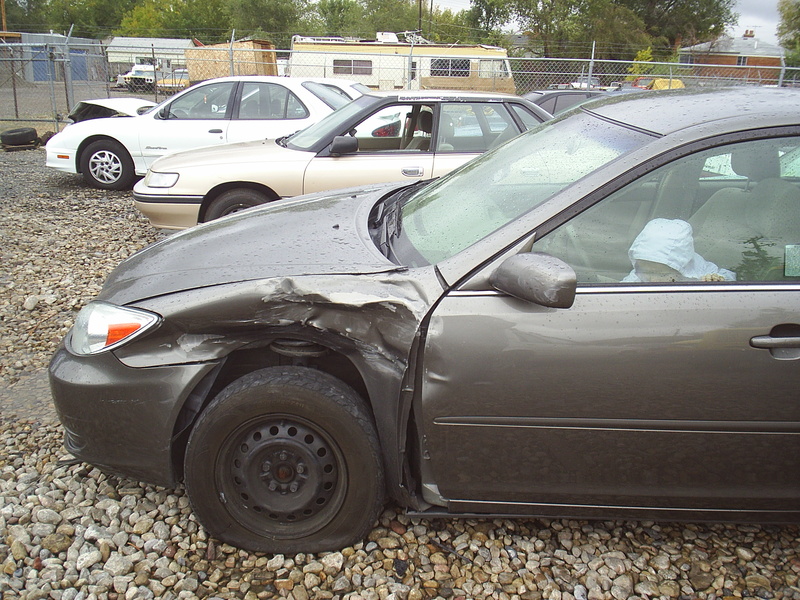 Here is our wrecked car- it doesn’t look so bad, but it was about 10K in damages! The rest of the pregnancy was filled with ups and downs. In November Tori and I got the flu and were sick for what seemed like forever. In December we drove all the way to OR to see my family for the last time as a family of 3! It was a LONG drive and I would never do it again pregnant. On the way there and back we drove through blizzards, which is also something I’d rather not ever do again. 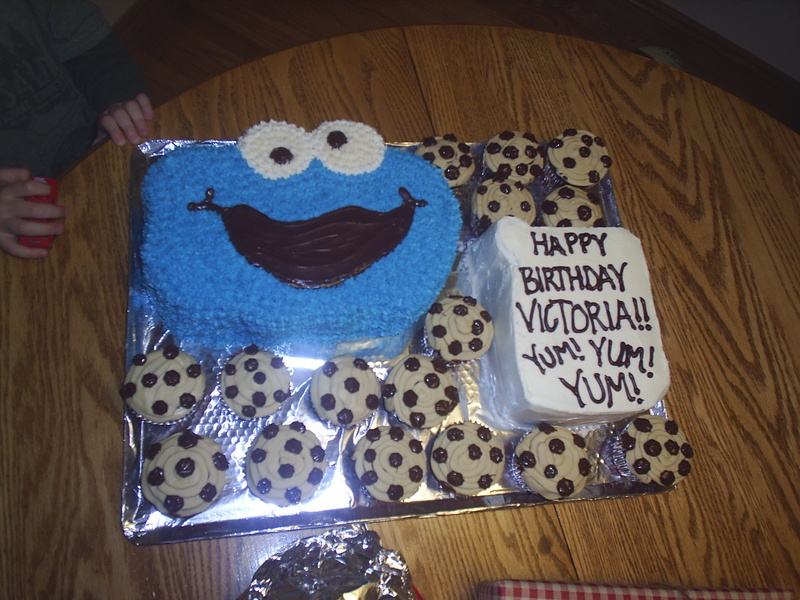 In January Tori turned 2 and we had a big party for her with a big Cookie Monster cake. In February Tori and I got Hand, Foot and Mouth disease, which normally only affects little kids, but since I had a compromised immune system I got it. It was miserable! I had about 20-25 canker sores all over my mouth, cheeks, tongue, lips and gums. I lost 15 pounds in about 10 days and it was not fun. March came and went without incident. My family came the weekend before my due date. They stayed for about 5 days and waited for Charli to show her face. She was not having anything of it. While they were here, my dad suggested I move around a bit(as if being a mom to a toddler allows me anytime to not be moving). So, I played some lacrosse with my Dad and little brother. After that didn’t induce labor he suggested jumping jacks. Its always hilarious to me to hear men suggest how to bring on labor. Anyway, did that too, with no results! My midwife attempted to strip my membranes, but couldnt quite get to them. We ate a garlic chicken pizza from Cafe Trio thats supposed to induce labor. My doula did some aroma therapy and accupressure. I went and had an accupressure massage. I drank raspberry leaf tea. I walked for hours, and even up a massive hill. All to no avail. Of course there are a few other methods we tried, but I’ll spare those details. Charli did NOT want to come! I’d been having regular contractions for quite some time but they’d always fade. A few days before, at the very end of March I had contractions, strong and steady, for about 5 hours. I was sure I was in labor. Nope. They quit and didnt come back full force till a couple days later. The night of April Fool’s, I’d had some really good contractions, probably do to my earlier appointment with my midwife. After multiple attempts to strip my membranes, she was finally able to do it! It hurt like heck, but all day I’d been having strong, consistent contractions. After tapering off some, I ended up just going to bed that night and being able to sleep, which I thought obviously meant, no baby. At the time we were living in our old crappy duplex and the neighbor was a semi truck driver. I remember the morning of the 2nd, he started his truck at about 6am. It woke me up and I realized I was still having contractions. I got up and was starving! I remembered with Tori’s labor I woke up starving in the morning and had eaten a crappy breakfast, which turned out to be my last meal for 2 days, and I’d regretted it all during labor when I was so hungry and weak. That morning of the 2nd I went upstairs by myself and watched the sunrise and Fox News, while enjoying a bowl of Strawberry Frosted Mini Wheats. And by a bowl, I mean half the box. Finally satisfied I went back to bed. It was around 8:30 that Dave woke up. I was still having contractions and at times they were intense, and mildly uncomfortable. Dave delayed going into work and we kept wondering if it was the real thing. At about 10 I finally told him to just go to work; this baby was not coming today. HA! A few hours later I called him and screamed at him to get the @#$% home cause I was having a baby. It felt like FOREVER waiting! I had some leakage and figured that my water broke, as it was a green tint- which means meconium stained. No bueno. Originally our plan was for a VBAC and to stay home as long as possible. I knew this was not going to be feasible. After calling Dave, I called his mom and she asked if I was in labor. I was in so much pain and so shocked that she thought I’d just be calling her to come and take Tori in the middle of the day, the only thing I could think to say was, “CAN YOU PLEASE COME GET HER? !” She said she’d be right over. The pain was so incredibly intense that I got in the shower. Tori was just over 2 and adament she get in. She stripped off her clothes despite me begging and pleading and hopped right in. Literally- 5 seconds later, my water REALLY broke- right all over her! I was freaking out, cause it was badly stained with meconium(due to me being 10 days post date!) and Tori just kept saying, “Mommy pee on Tori!” While I insisted I did NOT pee on her! I managed to get her and I out and get her dressed. Thankfully Dave showed up minutes before his mom. I let him know I wanted no one in the house and he finished getting Tori all ready and out of the house. After they left he and I enjoyed some quiet, painful moments, in which he reassured me everything was going to be fine. It was pretty intense, but at the same time so tender. With Tori, neither of us knew what we were doing and so we raced off to the hospital while I called everyone I knew. It was a rush and I’ve always wished we would have stayed home longer. Their was no intimacy or sweet moments of reflection on the journey up to that point. It was nice to be able to just relax some with him there this time around. On the way to the hospital, I called my doula, who I thought Dave had already called. Turns out, he had accidently dialed a different Jennifer, from his mission(! ), and left a frantic message about how I was in labor and how my water was meconium stained and we were going to the hospital. So, she was surprised we were already on our way. She talked me through contractions on the way up and kept me calm. When we got to the hospital, Dave asked if I wanted him to drop me off. I said that no way was I being dropped off, or put in a wheelchair, cause soon enough I’d be stuck in a bed for way too long. We walked into the hospital and I just remember some annoying person coming up and asking me if I wanted a wheelchair- they were standing right in my way! I responded “NO! I’M FINE!” and kept walking. In the elevator there was BARELY enough room and I just sat there looking at the full crowd thinking, “OH MY HELL, if I do not get on this elevator I’m gonna cuss someone out.” Thankfully people moved and let us in. When we got in I just tried to keep my head pointed to the floor so that no one could see my face writhing in pain. The girl next to me asked if I was in labor. DUH. I wanted to reply, “Nope, actually this is a watermelon I regularly carry around, and I enjoy hyperventilating- what about you! ?” I answered a very forced “yes”. The whole elevator was so excited and as we came up to the second floor they were all full of congratulations and well wishes, “Good Luck!”, and “IS IT A BOY OR GIRL! ?” I yelled “ITS A GIRL!” as the elevator doors closed. We’d called the hospital to let them know I was coming and to reserve a room with a tub in it. My preferred method was to do a water birth. The room was already to go and we walked right in. Shortly after, my sweet doula Jennifer arrived. She immediately helped me calm down and breathe better. The nurse we were assigned at first was terrible! I had been diagnosed as Strep B positive and was supposed to get a crap load of antibiotics as soon as I arrived. I let the staff know I wanted nothing additional. When Irma came in she immediately started doing her thing without any sort of consideration for me. I called her out on it and asked what the heck she was doing. I didnt want IV fluids galore. She went off on me. She told me it was going to burn like hell and if thats what I wanted she’d give it to me. A few minutes later I asked Dave to go get me some crackers, as I felt very nauseated. She happened to be in the room and asked me, “You know you’re not allowed to eat while you’re in labor right?” I was livid. Here I was in extreme pain and about to birth a child and this woman thinks its time for a b— showdown. So I handed it to her. I told her that it was my understanding that eating during birth is discouraged, not forbidden, due to the risk of aspiration of vomit. Since I was fully conscious and not dilated past a 3, I let her know the risk was little to none that I’d throw up, before digesting these crackers AND furthermore- you would not ask an athlete to run a triathlon on an empty stomach with no water or sort of rehydration. She replied a very curt, ‘Well we don’t want no one eating no big macs and french fries” I was disgusted by her lack of proper English, lack of professionalism and lack of empathy to the situation. I looked at her and asked her “Did I ask for a big mac and fries? No. You can leave now, I don’t need you in here” Jennifer then looked at Dave and I and asked us if it was ok the way she was talking to me and treating me. Obviously not. She gently reminded Dave of his role and he went out and informed the nurses that Irma was not to come in our room again, and we’d be needing new nurse. My labor drug on and on and on. A family friend is a high risk OB/GYN at the U and so he came in and talked to us for a little while before leaving for the night. We ended up, to my dismay, getting internal fetal moniters as well as the OB on call(which happened to be our friend’s partner) regularly checking on me. I wanted this to be very intimate with little to no people around. Thankfully it was still able to be like that. Dr. Howard Sharp, was the OB, and while at first was a little stand offish- warmed up after Jennifer gave him a talking to. He was fantastic and we couldn’t have asked for more. My labor went on until about 12:30am, at which point, 3 midwives, and 2 OB’s checked me and both confirmed that my pelvis narrows towards the base instead of getting bigger. Charli was showing signs of distress, I was physically spent and verging on delirious from all the pain. I’d gone the entire time without any medication for pain. And on top of that, had 2 rounds of ridiculous amounts of antibiotics pumped into me- which burn like crazy! I looked at Dave, Jennifer excused all the staff for Dave and I to talk, and we decided to do another c-section. 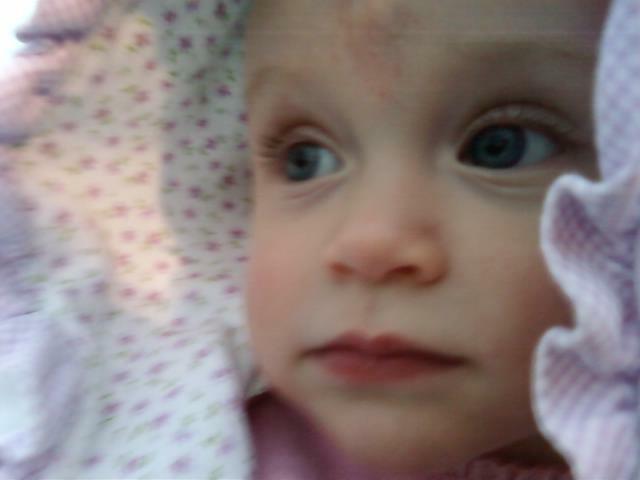 My scar from Tori’s birth was tearing, our baby was distressed and it was enough. It was possibly the most disheartening and joyous moment of my life. I did not know it was possible to feel such defeat, but yet such excitement as well. Around 1am we wheeled out of my room, past the nurses station onto the OR. I glanced at these poor nurses, who for the last 12 hours had no doubt heard me scream every cuss word in the book, as well as some new ones, as they had mistakingly put me in the VERY FIRST ROOM as you walk into the delivery ward! Funnier even still because my doula had interviewed with another prospective mom and while discussing past births, this lady gasped, “THAT WAS YOUR BIRTH? 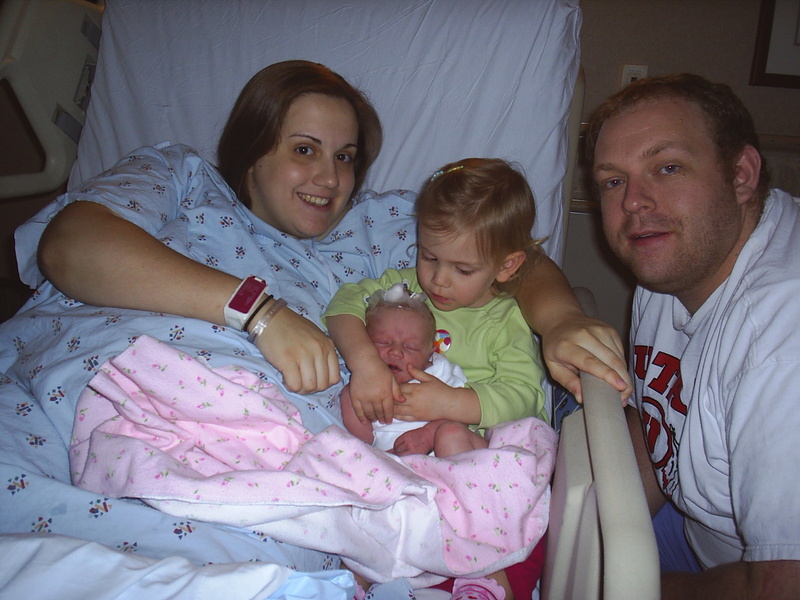 !” She had apparently gone to take a tour of the maternity ward the night I was in labor and heard me screaming. Poor woman. That was her first child too. In my defense, Jennifer had told me she’d never seen a “transition phase” last as long as I did. Dave later informed me there were stretches of contractions that lasted 7 minutes with no break. Tell me about it! My coping mechanism was to count. I’d count through each contraction. I knew they’d last about 100 seconds at most and so I figured if I could get to 50, I was half way over and on the down turn. At one point I had counted to something like 400 and yelled, “WHEN THE —- IS THIS GOING TO END? !” After my delivery, Dr. Sharp came in and let me know that I’d made a “college effort” for natural birth, and certainly had “climbed the Mount Everest of childbirth”. 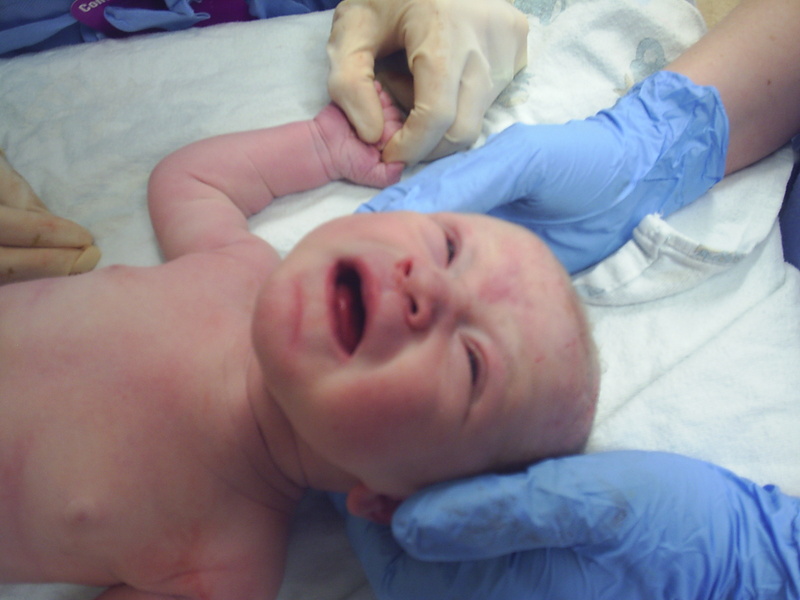 When we finally went in for the C-section, I had another sub-par anesthesiologist. He was a jerk! I’m not a fan of residents(aka STUDENTS), but in this case, the resident was so profressional, and kind, and caring and the “pro” was the opposite! My OB, Dr Sharp and his team were so caring and had Charli out in only a few minutes. When he pulled her out, he immediately held her over the drape and said, “HELLO MOMMY!”. To me, a display of concern and a realization that this was more than just a job he was doing, and that I was a human being- not just another patient number. When I saw her, I of course started sobbing! Dave went right over and watched as they got Charli cleaned up. I knew something was wrong, when I kept asking how much Charli weighed and got no response. 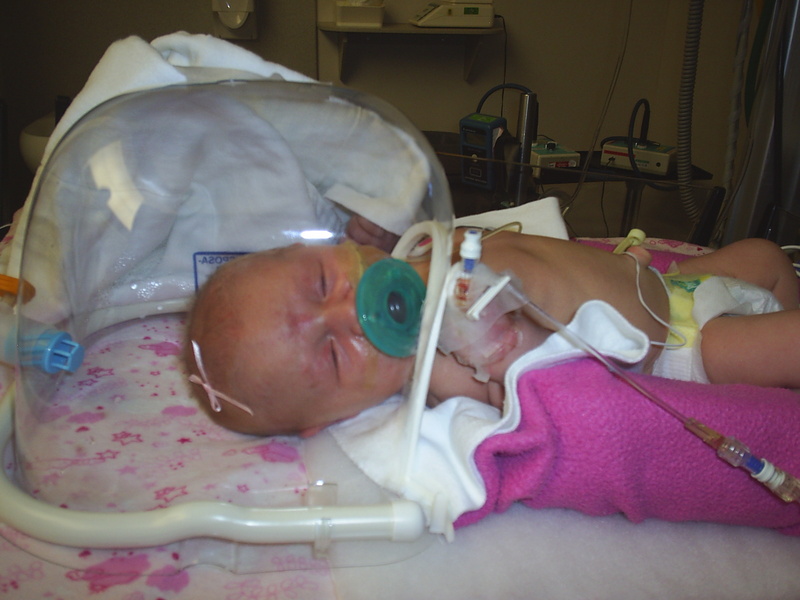 She was screaming bloody murder and her cries were only broken by what I assume, was the suctioning out of her lungs. It was nerve wracking. Here she is minutes old. Before Dave left with her to the nursery, he was able to bring her over to me. Jennifer was able to stay with Dave and I during the whole surgery, and after Charli and Dave went to the nursery, she stayed with me. I do not know what I would have done without her! She stayed with me through the hours of recovery, and until we were able to go see Charli. She was with me when the pediatric residents came in and informed me Charli was in the NICU. 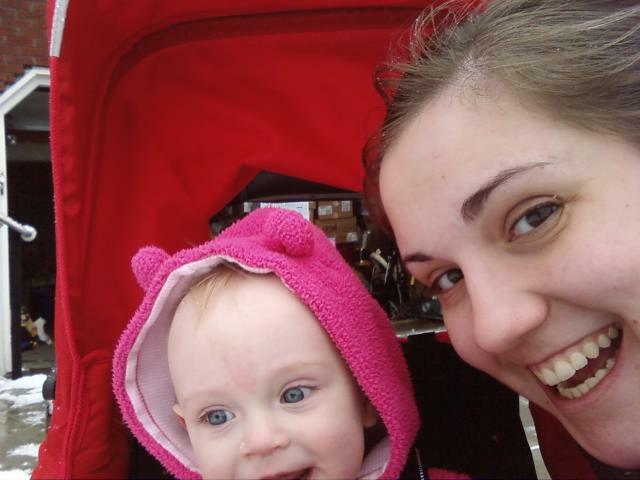 She was such a strength and comfort to me, when previously(with Tori’s birth), I had been all alone. I am so glad we hired her, and even more glad, she continues to be a great friend. Here is Charli in the NICU. After the ped. residents came in, my mind went into a delayed frenzy. I could feel the adrenaline rushing throughout my body, but it was the oddest experience, because I’d lost so much blood, was so exhausted and still in shock of what had transpired, it was like this out of body experience, where in my head I could feel the frantic-ness of it all, but I was not physically able to express it. We were later taken to Charli and they informed me that she had bilateral pneumo-thoraces and some sort of infection. Her CRP levels were ridiculous, her white blood cell count was an issue, as well as all of her other vitals. After a very short visit, they sent me back to my room. Jennifer left shortly after. My parents had said not to call if it was after 12am or before 6am their time. I figured they’d want to know about this though, so I went ahead and called them at about 3:30 PST. I just started sobbing. I could barely get it out and was a wreck! I could not move due to the anesthesia and just wanted my baby. After I got off the phone with them, I looked at Dave and just started bawling. Everything was incredibly stressful and I didnt even know what to say or do. I tried to sleep, but woke up sobbing every hour. In the morning, we were able to go and be with Charli while they did xrays on her tiny little body. 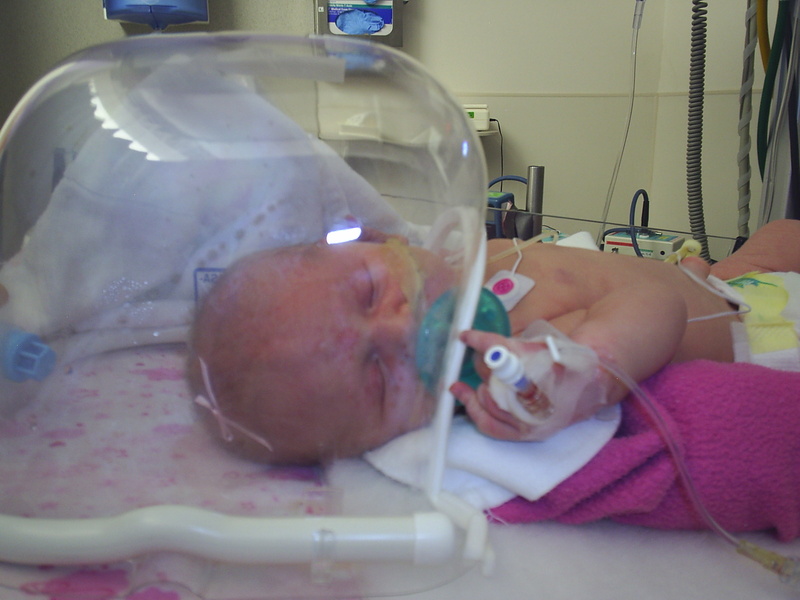 She was put in a “headbox” which gave her 100% humidified oxygen 24/7. Thankfully she was only in the NICU for about a day and a half. Those were the most stressful hours of my life and I was so scared and worried for my little baby. 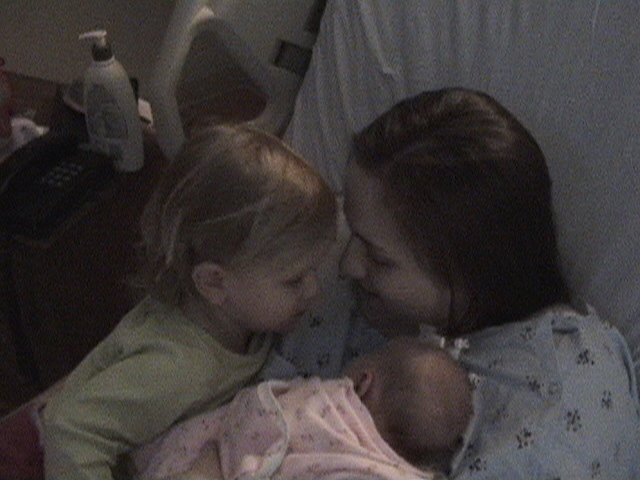 I felt terrible for being so upset, as in comparison to her room mates in the NICU, she was doing fantastic. The NICU nurses kept remarking to us how nice it was to see a “normal” baby with so few problems. But of course, I kept thinking that if she had so few problems then why was she in there. Here’s mommy and Charli bonding for the first time. There were a couple of really crappy nurses in there and at one point I had to get really upset. We had come in for a visit and Charli was screaming. Instinctively I knew it was not a baby scream- this was a hurt scream. I called the nurse over and she said she was fine, but that I was overstimulating her and we were causing her to cry. I was furious. She walked away and I looked at Dave and told him that was not it. I started looking all over for something that could be wrong. She was getting hefty doses of antibiotics because of the infection that showed in her blood. I knew they burned but couldn’t figure out why her cries were so continuous. I finally checked her IV. There was a problem with it and blood was coming out into the line, and her port had gone bad. The antibiotics were continually dripping into a bad port! I have a cousin who was badly burned at birth on her hand, because (from what I remember) she had a bad IV and the drugs had seared her skin. She had to have skin grafts and still has a scar. ; I’m just so glad I was insistant. I called the nurse back over, who finally agreed that something was wrong. They switched the site to Charli’s other hand and she quickly fell back into a semi conscious state, AND stopped crying. Look closely and you can see her little bloody IV. Every time we went in to visit Charli I’d ask when she’d be out of the headbox and when I’d be able to hold her and nurse her. I was always given wishy washy answers and it was very disheartening. On Friday morning, there was a lady who I thought was a volunteer. She appeared mentally handicapped to me, and I was shocked they’d allow her back into the NICU- turns out she was a nurse- OUR nurse at that! I did my normal round of questions and finished with, “Can I hold her now?” She answered yes, but wanted to go check with the doctor. I was so excited and freaking out. 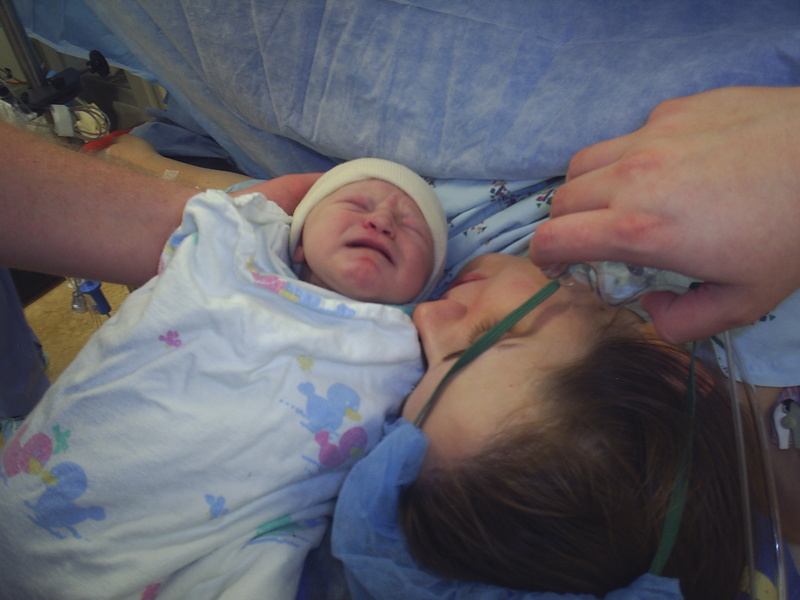 I was ready to nurse her, and even more ready to hold my baby for the first time. She came back and said the doctor said I could not hold her. I looked at Dave and tears welled up in my eyes. I was ready to lose it and start punching this woman. Dave quickly suggested we go back to the room so that Charli and I would both be able to get some more rest. I went back and crashed. I sobbed the whole way back to my room and then fell asleep. I swear it was only 10 minutes after I’d fallen asleep that I heard my door open. I had not slept more than a few hours in about 48 hours and Dave and the nurses were constantly asking me to slow down and just rest. I couldn’t believe that one of these nurses would come in while I was sleeping! It turned out to be my nurse, Michelle, who was a God-send. She was spectacular. We later learned that the charge nurse Carol, who admitted Charli and was the one to diagnose her “pneumos” had handpicked Michelle for me and had continued to assign her to me for the duration of my stay. She was fantastic. Michelle quietly came over and layed her hand on my arm and said, “Sarah, the NICU just called and they’ve said you can come down to feed your baby.” I about flew out of bed. I yelled at Dave to wake up and get me out of that bed and down to my baby-NOW. I wasnt taking any chances that someone had been misinformed and had told us wrong. We were going to get down there before someone could change their mind. On previous trips, I’d always had to tell Dave to slow down because every little jerk or bump along the way hurt so bad. This time, he slowed down once and asked me if it was too fast. I quickly let him know he was not going fast enough, and to quit talking, just push. When we got there, the “special” nurse was still there and I gave her a glare/staredown and she quietely and quickly unhooked Charli from what she could and then drew the curtains for us. In that tiny room I was able to hold Charli for the first time, close to my heart, and just weep. After a few minutes of just holding her she started to root around, showing she was hungry! I was SO excited. They’d fed her my milk through a feeding tube in her nose previously, but she didn’t “handle it well” and was put back on strictly IV fluids only. The whole time I told the nurses that of course she didn’t handle it well- its not normal to eat through your nose! That if they’d just let me nurse her, she’d do better. At about 10am Friday morning, Charli nursed for the first time. 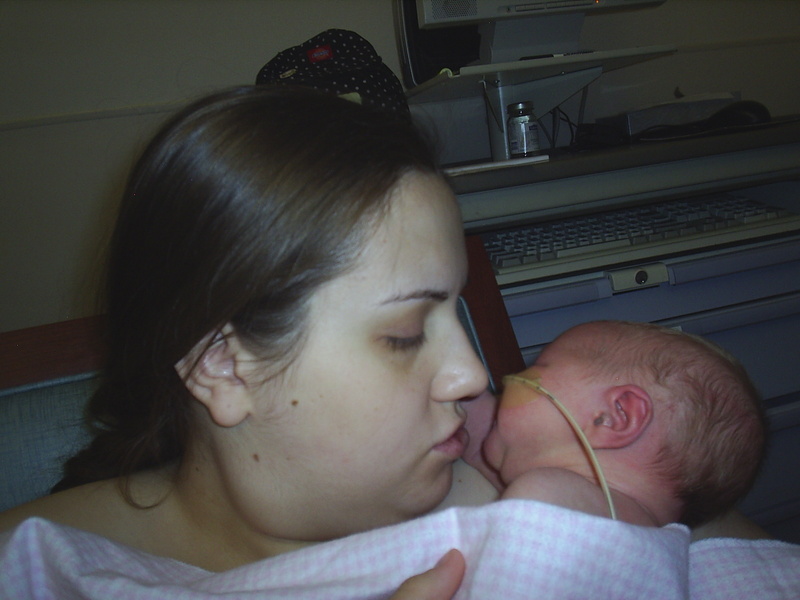 She didnt eat much at first, but quickly decided that she did not want to be put down or unlatched from mama. We stayed for about an hour and then spoke to the doctors. 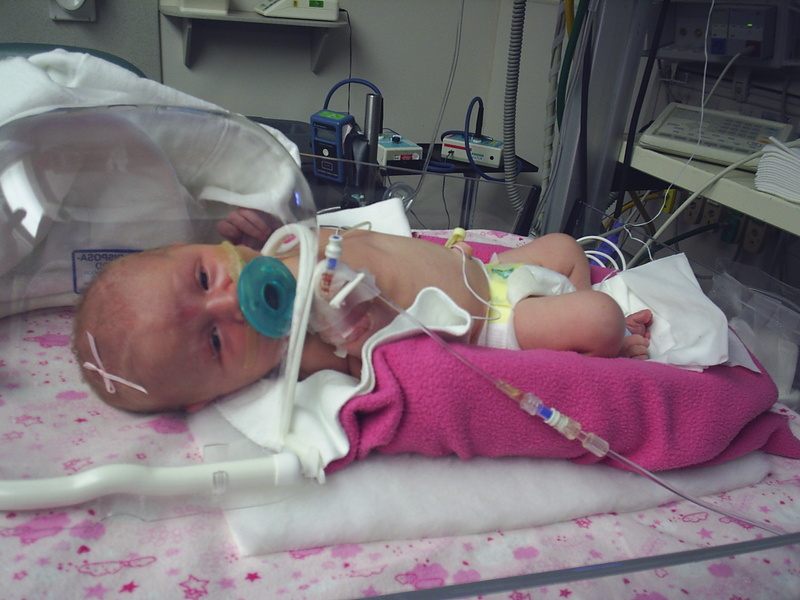 Her vitals had improved, as well as her oxygen saturation. We finally convinced them to let her out of the NICU, based on her improvements. Here is the first time I was able to hold Charli, as well as when Daddy and daughter were able to be together in that tiny little room. 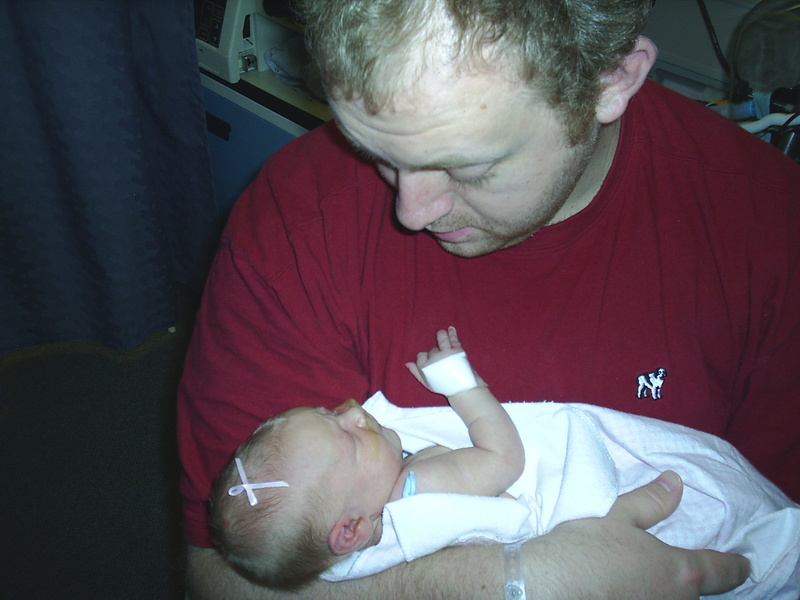 She was moved to the nursery on the maternity ward side at 2pm that day! She was still not allowed to be in my room, and only one person plus Dave or I was allowed to be back with her.Here is Tori getting her first look at her sister. 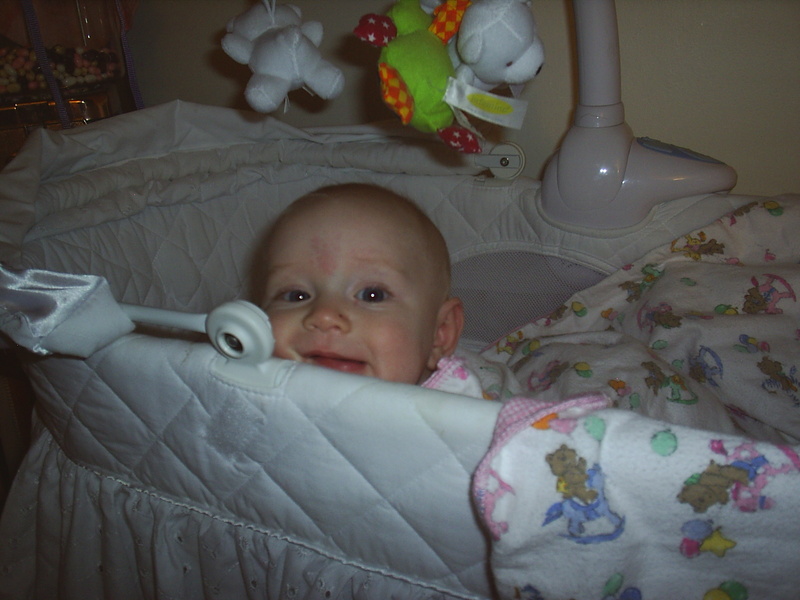 She was not with other ‘normal’ babies, but it was a definite step from where we’d been! She spent all of Friday in the nursery, and anytime she cried when we weren’t there, I had them call me and I came down to feed her. Saturday afternoon they released her into my room! We were so excited. She still had to be taken back to the nursery every 2-3 hours, but that meant we could have her for 2-3 hours solid, just in the privacy of our room. 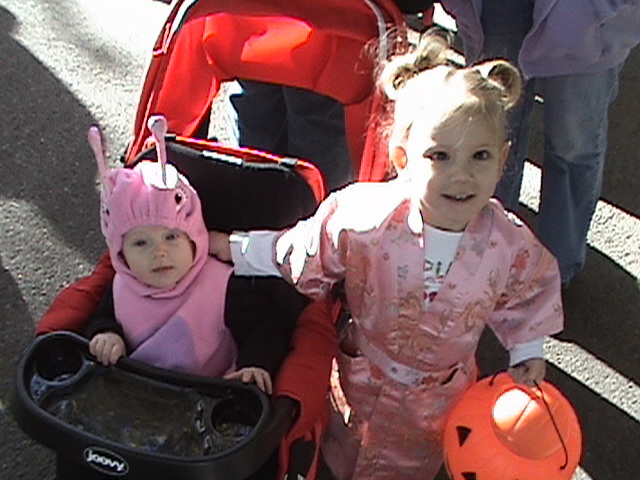 That also meant that Tori could meet her little sister! 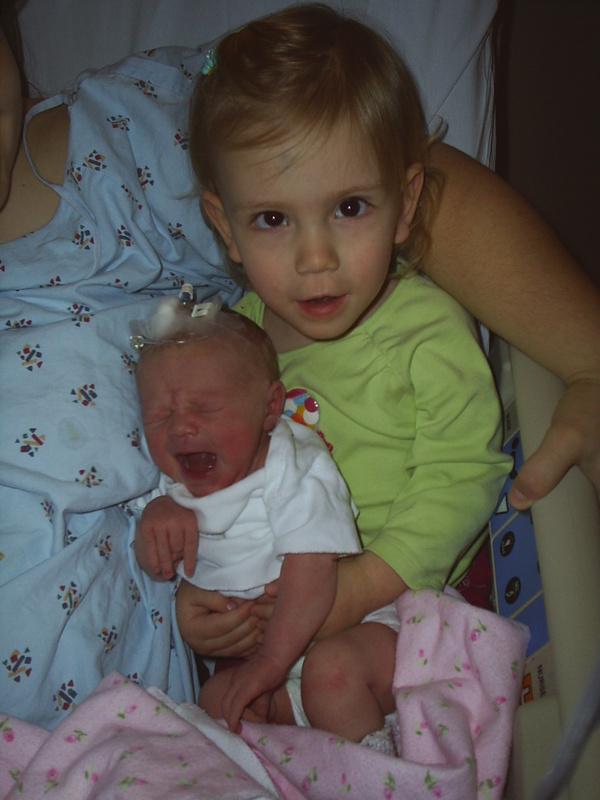 Tori was a little unsure, and since Charli had an IV in her head, it was different from what she’d expected, and what we’d prepared her for. Overall, she was just excited to finally be able to meet Charli and was anxious to hold her. Here they are together for the first time! There were some pretty intense moments with the doctors and staff during the rest of our stay. 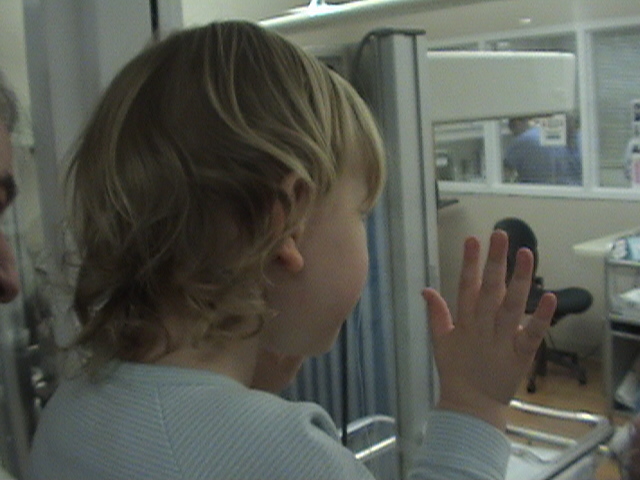 They wanted Charli to stay at the hospital 2 days more after my release. I had a hard time seeing what was so wrong with her because all her stats were within the ranges they wanted. She was eating great and seemed alert and just fine. Her blood levels were the only concern. Finally, the doctor on call, Charles Ralston, met with us and agreed that, it was more important for us to be together and to go home together, than it was for her to stay for the antibiotic treatments twice a day. He agreed to release Charli at the same time as me, if we’d agree to come back for two days and get antibiotic shots in his office. At that point, I’d agree to about anything to take her home with us! Dr. Ralston was actually recommended to us by that same charge nurse Carol, who was also a living angel during our whole ordeal. Dr Ralston is now both girls’ pediatrician, and he’s spectacular. Here is our first family photo! As everyone knows, Charli is now a happy healthy one year old! She is a fantastic baby, and rarely fusses without cause. She is so very different from Tori, but still tries to do the same things Tori does. She is a lot more even tempered than Tori, but makes it known when she’s unhappy. About 12 weeks after I had her I had major surgery- She never skipped a beat. She ate from a bottle(reluctantly at first) but then only a few days later went right back to nursing. She weaned herself a few weeks ago. 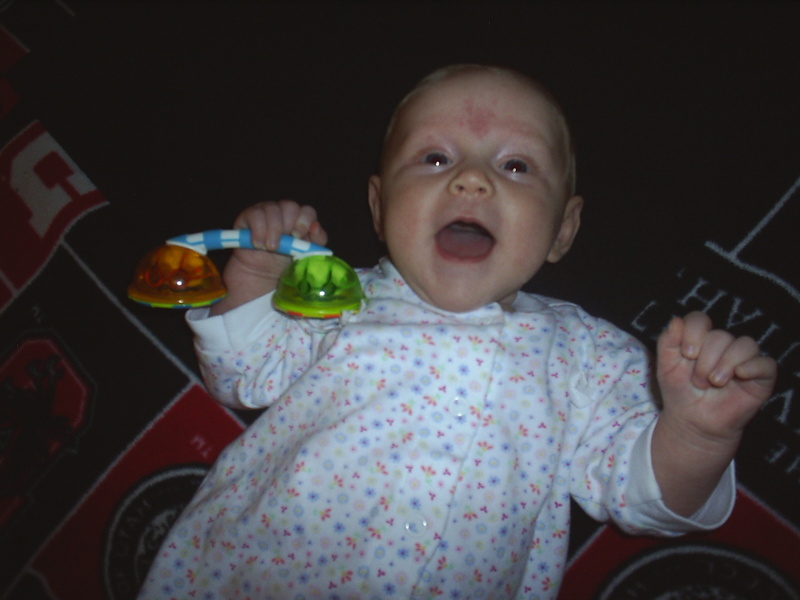 Charli was born with bright blue eyes and a gorgeous little smile. She loves to giggle. She already says about 10-15 words and loves to play peek a boo. She is a MONKEY! She will attempt to climb anywhere she thinks has something enticing. She has no fear, and keeps pretty good pace with Tori. 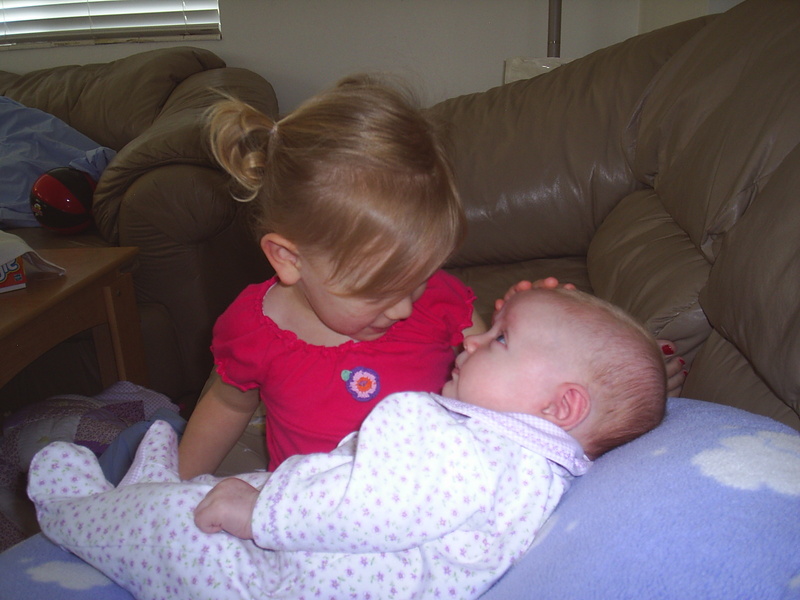 She loves her sister and loves to follow her around the house and when Tori doesnt want to pay attention-Charli will come up and clap her hands or swat at Tori to get her attention. Its quite hilarious. 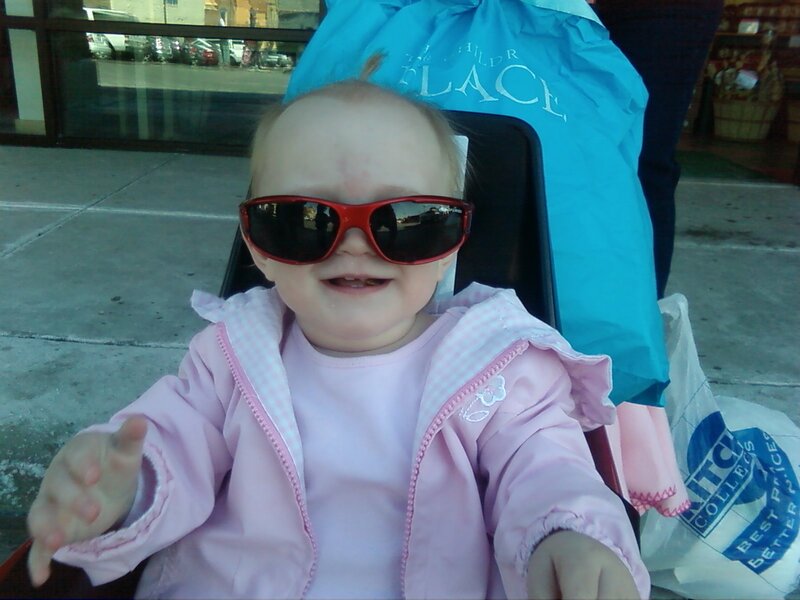 Charli started walking right before she was 10 months and is a very speedy kid! 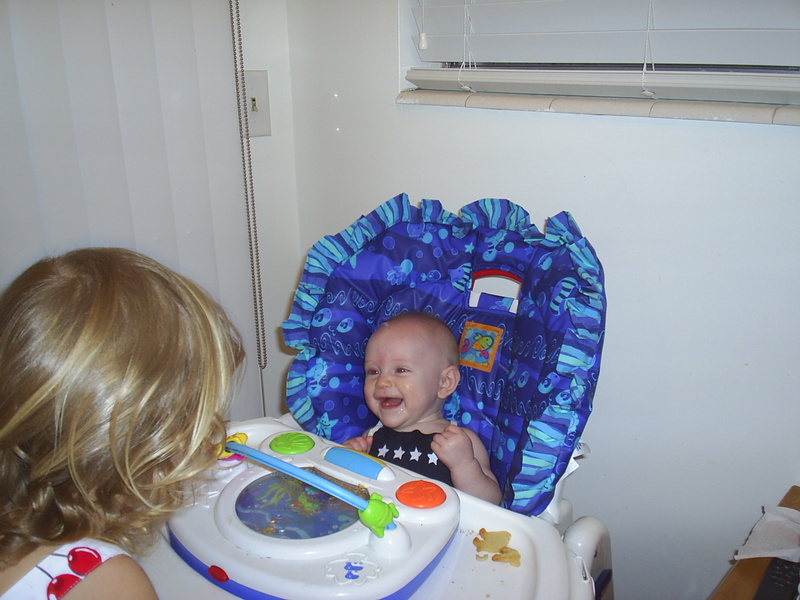 She hates baby food and went right from breastmilk to cereal and onto table foods. She is more finicky than Tori, and eats like a bird. 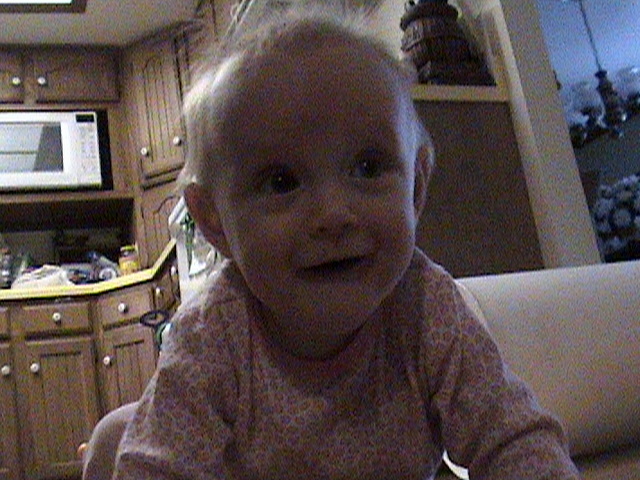 She is tall and skinny- about the 80th percentile for height, and 40th percentile for weight. At birth she weighed 7 pounds 8 ounces, and was 21 inches long. Now, at one year old, she weighs 20 pounds and is 31 inches long! Its crazy to me how fast time has flown by. I have so much enjoyed the baby phase with Charli and am so sad to see her grow up so fast. But, I’m also so excited to see the things she’ll do in life. She always has a ready kiss for me and is a sensitive, intuitive babe, with so much joy and happiness that she shares with everyone. She has the wildest hair and people comment on it wherever we go. She’s gorgeous and I could not have asked for a better baby. I’m so glad that I’m her mommy. I’m so glad(most days!) that I get to stay home and watch Tori and her interact. I love the bond they are forming already. They are both so sweet to each other and I love hearing Tori call Charli her best friend or tell her she’s “the bestest sister in the whole world”. These times with them are simple and I’m so happy to be where we are. I wish life could stay this simple. While its not always easy, and things get pretty frustrating, especially lately, I am always keenly aware of how short it all is and how it can be taken away in an instant. We are so glad that God has blessed us with two beautiful little girls that we can raise to be amazing human beings who I know will accomplish much. I’m so proud of the two of them already. Thanks to all who called or wished Charli a Happy Birthday. Tonight we just did a small dinner with us and Dave’s parents. Charli enjoyed chocolate frosted chocolate cupcakes, which she managed to eat quite a bit of considering all the places it was smeared! She got a “Little People” SUV and a pair of fleece lined crocs from my parents, and Dave, Tori and me gave her a fisher price zoo toy. 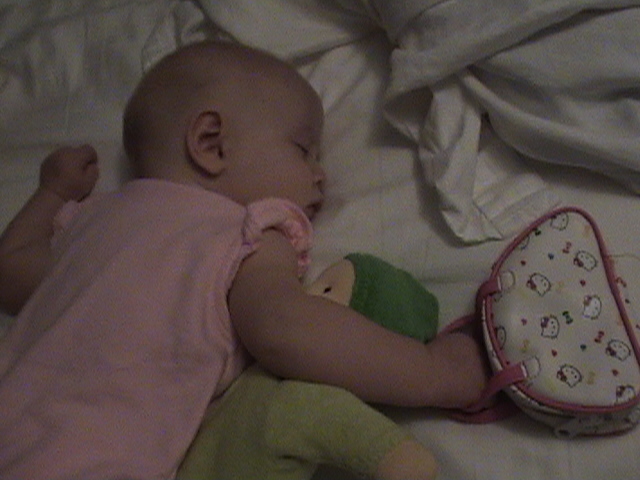 She played with both, and shared, though reluctant at times, both with Tori. We are so blessed and are grateful everyday for the lives that we have. I am so happy to be a mom, no matter how stressful and aggrivating it is at times. I love my girls, and Dave and I love the life we’ve made for ourselves. Daddy and the girls dancing. But mostly, I’m so thankful that all of that turned out so great. Charli is such a blessing in our family. Today was a little more eventful than planned. It started out like every other busy day. (except for the snow, and the half hour late we left) We all got up early to take Dave to work, and then had an appointment right after. After the appointment we came home and played for a couple hours before Charli’s nap. Nap time again, started out like every other day. Tori watches Dora, or whatever else is on while Mommy puts Charli down. I can normally get an hour nap or so and then Charli keeps napping for another couple hours. Not today. She knows that if she ever has a problem to come up and get me. I leave our bedroom door open, and seldom she’ll come in and lay down, but most of the time she’ll come in to ask for help, or enjoy some quiet, sister-free time by herself. Today, the only thing I heard was screaming, at 12:41. Tori is a very vocal child, but not normally without reason. Today was a combination of a hurt scream and a fear scream. She would scream like she was scared, then alternate with shrills of pain. It was not pleasant. I thought she cut her finger on something and it was bleeding. So while trying to figure out how to try and keep Charli asleep, and find out why Tori was so upset, she kept up the screaming and scrambled into our bedroom. At this point, there was no keeping Charli asleep now. Tori continued to scream, “MY PANTS ARE HURTING ME!!!! MY PANTS ARE GIVING ME OWIES!!!!! !” All I got at first was her pants- so I just screamed back, “WELL THEN TAKE THEM OFF AND QUIT SCREAMING AT ME!!! !” As she stripped down, she heaved sighs of relief and ran to the bathroom. I ran after her and let her know I was upset that she’d woken Charli up. In the bathroom, she still whimpered and cried and begged me to put lotion on her leg. As I bent down to put some lotion on her leg, while still getting upset that she’d woken up Charli, I realized why the screaming and I started panicking! 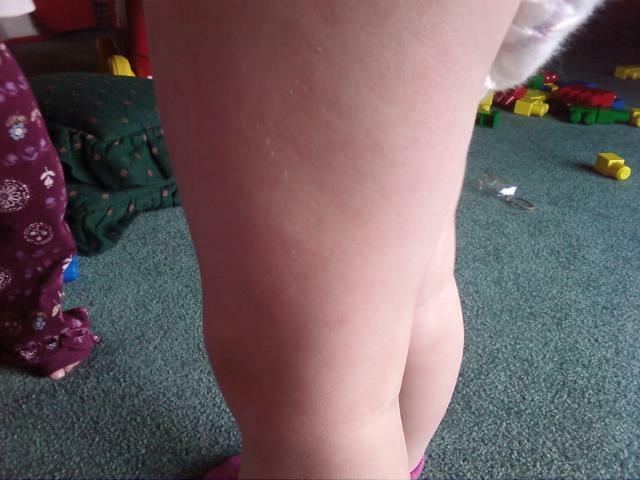 There were welts ALL over her little thigh! (Inset terrible feelings of guilt here). I asked her if there had been a spider in her pants and she replied negative. I immediately told her to stay there and went to check her pants. She’d left them in the middle of the floor between our bed and the door. I stood at the door scanning the floor for a spider or something on the floor but saw nothing. I picked her pants up and shook them, and nothing. As I dropped the pants, a bee came crawling out right where my hand had been! For those of you who know me, I am not a bug person. Not an animal person. Not a reptile person. Besides human beings, anything living I’m pretty much not a fan of. I am allergic to the vast majority of things, and the rest- just not an enthusiast. AT. ALL. I’d rather run, make that BOLT, for the hills then get near anything. Seriously… no joke here. When that bee crawled out, I just about screamed myself. There was Charli sitting on the bed, dazed because she’d just been woken up, completely unaware of this pissed off bee that I was sure was going to fly up and sting either one of us at any second. I grabbed a towel, threw it on top of the bee, and jumped. ALL. OVER. THAT. DAMNED. THING. And just to be sure- I put our laundry basket on top of the towel, which was on top of the pants, and started jumping again. I grabbed Charli, and closed the door and called Dave. When I called Dave, I was panicked. I assume if someone is allergic to bee stings they swell up like a blueberry within minutes, which thankfully, wasn’t happening. Allergies run in my family, more specifically, through me, and so I had no idea other than what happens to me. Thankfully it seemed Tori was alright, just really scared. At this point, thankfully, Tori seemed to be no worse for the wear. 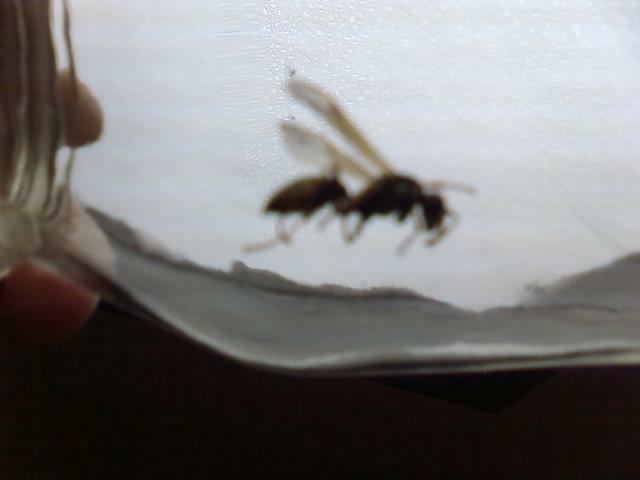 However, that stupid bee/wasp/devil creature was still upstairs looming under my one empty laundry basket. It made a good excuse for not having laundry done though! I had called Dave’s dad and told him and he said he’d come home to help me tape the door(more on that later), so I told Dave I’d just wait for his dad to come home and he could take care of the bee. Well, an hour passed by(its tax season people) and Dave mentioned that I should just go do it. Predictions of tonight ran through my head… in a bemused state I’d wake up wondering what was crawling all over me, only to realize that it was the bee I let go and didn’t kill and just as I’d come to the realization, the thing would crawl up my clothes and repeatedly bite and sting me, sending me flying out of bed in only my nighty all whilst scaring the bejeebies out of Dave and Charli, as well as waking up the rest of the house with my shrieks. Ahhh, what a good pre-nightmare won’t do to a person. I asked Dave what to do and he told me to catch it. The thought of putting the bee through pain and suffering thrilled me at this point. All the stress and anxiety from the afternoon, coupled with the fact my little girl hurt REALLY bad, yeah… it was enough. So, I went upstairs and to my shock, the stupid thing was still alive! 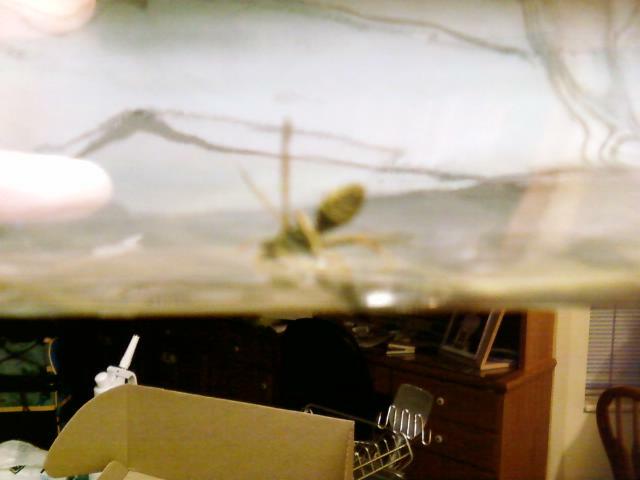 I caught it in a jar, sealed it up and gave the thing a good shaking. We kept the bee, and when it came time to go get Daddy I asked her if she wanted to take our new “friend” with us and show daddy. I offered her the jar to which she replied with hands completely out to the sides, edging away, “I’m not touching that bee, YOU put it in your bag and take it to Daddy.” Ah, like mother like daughter. We agreed that he’d be better sitting on the counter. After we finally got home I was sure the thing was dead. It was on its back! I gave it a good shake when all the sudden the wings went NUTS! 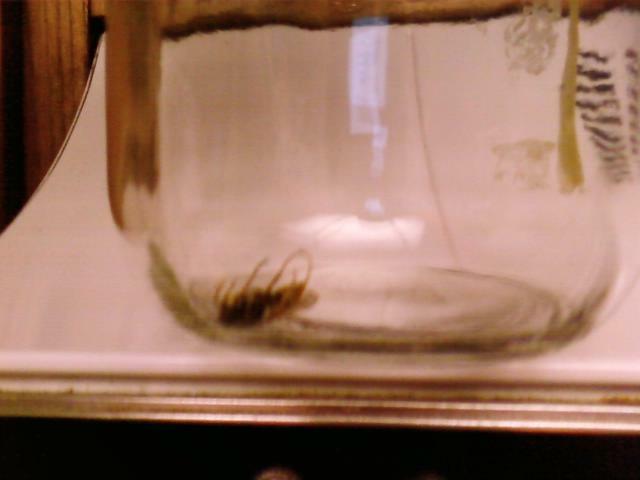 It was still alive after almost 12 hours in that jar! Needless to say, his home is still in the jar on the counter, and I’m still having nightmares about this dead bee coming back to life and getting out, only to attack us midway through the night. Who knows where the stupid thing came from? Here’s my guess. Dave’s parents’ back door is older. From years of hell-frozen-over-Utah-winters and Death Valley hot summers, it has warped some, so that it’s fairly drafty and a small bug could crawl through to the inside. Up until last week, there was tape covering the door, so the draft (and bugs) wouldn’t come through. Why up until last week? I really think that the bees started coming out of hibernation, or whatever they do for 6 months when it freezes over here. It got fairly warm(50’s) for the last couple of weeks, only with the odd cold day. The past few days have been windy and freezing! We’ve had snow, and freezing rain and yuckness all around. So, my theory is this bee got really miffed and came for a visit inside… Not sure how he chose Tori’s pant leg, but whatever. Thankfully, grandpa came home, taped up the door again, and even measured and said something about replacing the door! The only other possible thing it could be, would be an egg from last summer. Why last summer? Rose had an eerily similar situation with some of Dave’s nephews… They threw rocks at a nest, and REALLY pissed off a lot of the bees. They all had stings all over them, and even managed to bring some of them inside, underneath some clothing. So, either those bees laid eggs that have amazingly long shelf (couch) lives, or else, the bees remember the house that pissed them off. Either one, not likely, but the only other explanation for a bee in the house! So, that’s the story of the bee, as witnessed by the Payne’s… at least Tori’s not allergic to bee stings (the same sentiment echoed last summer, though the boys provoked the little beggars… Tori did not!). 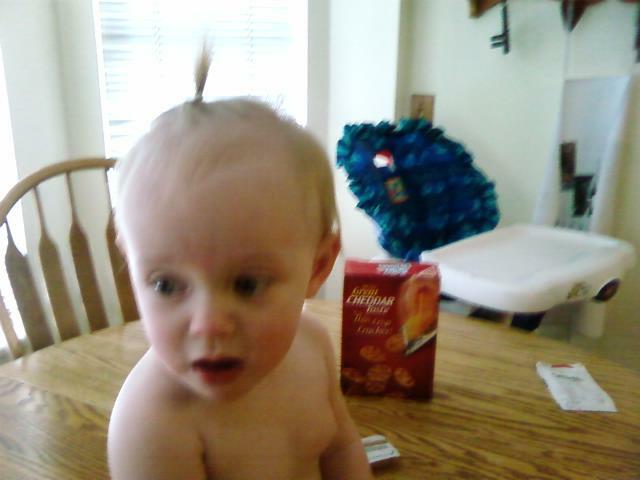 She was one tough little chick and only complained when I wanted her to put pants on. She was sure there was another bee in her pants, poor girl! After turning them inside out, she was alright, but has been on the bee lookout all night. My favorite part was when she said, “MOM! The bee was trying to eat my leg! MY LEG IS NOT FOOD! I need it to walk!!! !” I assured her no bee was going to take her leg, and certainly he found out it was not food! Here are some more pics! Sweet Tori! And Charli… charli was extremely concerned and kept clinging to Tori! So SWEET! And one last one tonight… this is one of the American Idols from this season… can anyone guess who it is!? 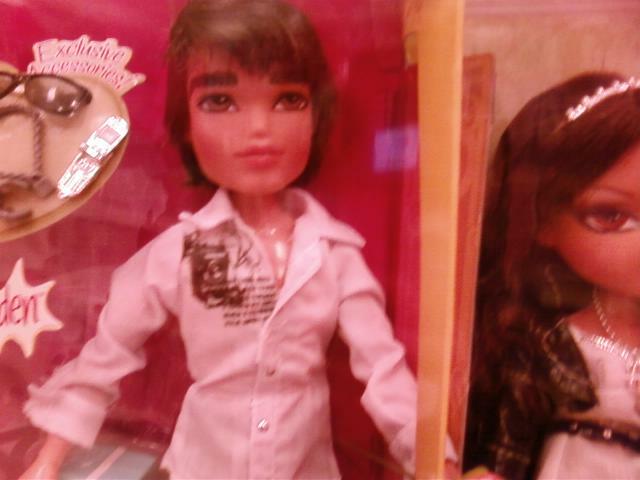 We were at Target and Dave saw this doll and said, “Look who it is!” Tammy and Emily can appreciate this! =) G’night all! Busy! And a belated birthday to my sweetie. So, I have some fun times looking at our blog stats. It gives me the names of other sites that link our page to theirs and how many times someone from that site views our blog. It also gives me search engine results that have led people to our blog. Today it was, “vicente fernandez impersonator”. REALLY? really? I was pretty sure we’d made no mention of Mexico’s idol, but apparently something in our text leads google to think this blog is a fabulous reference point for him. Must be Dave’s singing in the shower. Things have been really busy here. My mom came out for 6 days and left yesterday. It was a great visit with her, and its funny how much things have changed. 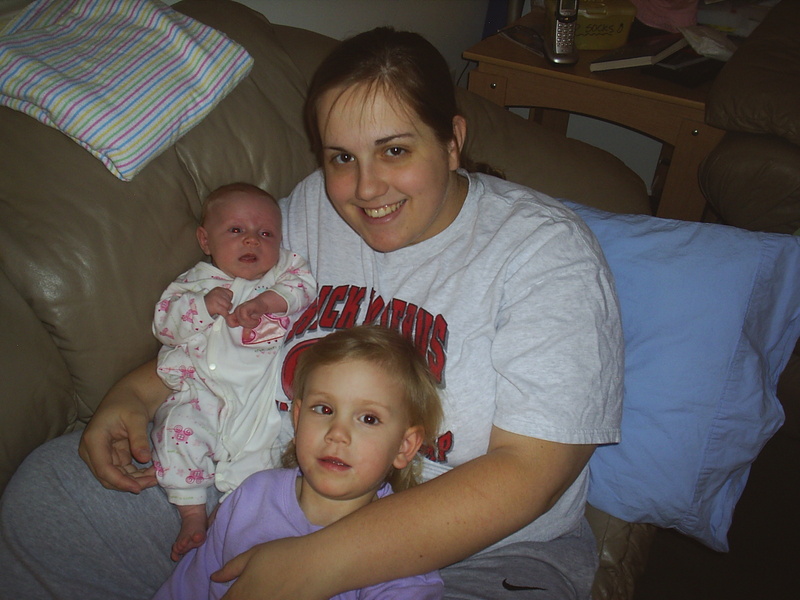 She still thinks she’s a mom per se, not only to me, but now to my kids. Ahh the cycles of life. It was pretty funny. We had a GREAT time at the hotel she booked for the weekend. Tori even taught Daddy how to swim!!!!!!!! We took the girls to the pool the first night. Tori was apprehensive to get in because there were six, yes SIX, obnoxious children whose mother was not paying attention to anything; gotta love Utah. They were “just being kids” but there is a point when it gets out of control. They had some pool toys that were airborn more than a few times at other people heads, furniture and fixtures etc… Charli was so scared she screamed when we put her in the pool, so my mom walked around with her for most of the time. The second night Dave went and got Tori some floatie wings and she swam around the whole pool! Thankfully, we were the only ones there. Both girls loved it! Niether of them wanted to leave when we said it was time for dinner. We had a picnic with Nana that night and both nights Tori got to sleep with Nana! She was in heaven. Saturday afternoon we went outlet shopping in Park City. IF we stay in Utah, I’ve told Dave thats where I’d like to live. Salt Lake can just be so disgusting sometimes. The people, the environment, the culture… all of it. So, hopefully Dave will get in to the Master’s, and we’ll be out of Salt Lake in the next 5 years. Speaking of the Master’s! Dave put in his application about 4-5 weeks ago. He finished his application, but unfortunately its not considered “complete” until your references email in their letter of recommendation. One of his references took about a week before submitting the letter, so its only been about 4 weeks since completion. They tell you you’ll have a reply in 4-6 weeks, in the mean time I’m going to go nuts waiting! We’re hoping to hear back any day now! I’m so excited and proud of Dave. He’s such a great guy. He tries his best in everything he does, and excels in so many areas of life. He’s a great dad, a great husband, an excellant student, a “valuable asset” to his department at work, and the list could go on and on. Dave tries so hard every year for my birthday. This year was no different. I told him all I wanted was to be out of his parents house. Unfortunately that didn’t happen, but not because he and I both havent been trying. Since we’ve lived here, we have looked at over 100 places. YEAH… thats a LOT. There is always something that we can’t budge on, and the 3 that we’ve applied for have just not worked out. We’re waiting to hear back on another one sometime this weekend, but there are also 3 applicants ahead of us. While its frustrating, I know that there is something in store for us. We just have to be patient. Its really hard, especially when we do things differently than his family. However, every single time an incident arises, Dave is always incredibly supportive of me and our family and our decisions. For my birthday, he went and got a cake, made me dinner, and gave me the piano bench he bought for the piano that is in the garage. There was also a very obnoxious, but cute card that had to do with coconuts… Unfortunately I’m not able to use the piano bench right now, but its really nice and hopefully when we get out of here, we won’t have to replace the piano. Its been sitting in the garage all winter, where its been freezing, and water has come through from the outside. 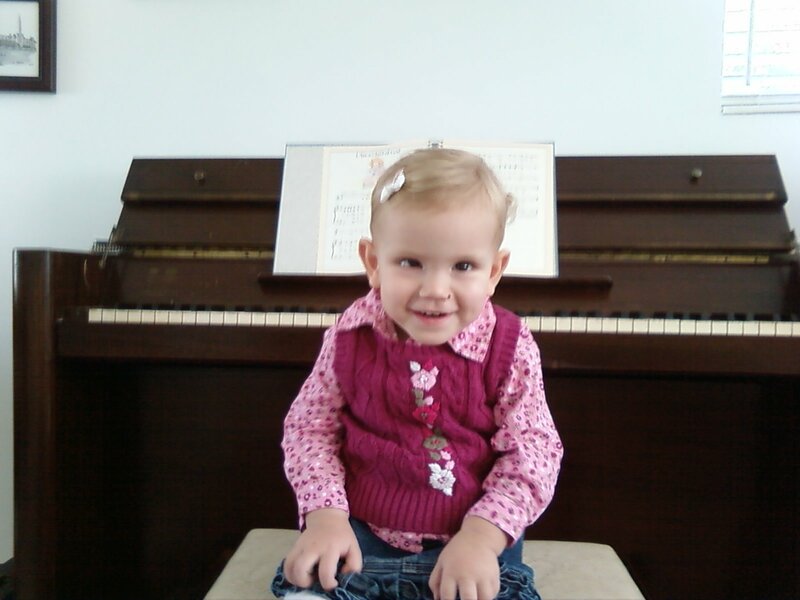 I’m so frustrated with it being out there because I was so proud when we bought that piano! It played well considering the age and condition it was in, and I miss being able to play. Dave’s parents have a piano, but its more aesthetically pleasing than the music that comes out of it. Dave’s dad refinished it, and its beautiful, but some of the keys don’t work and its out of tune. I feel like a chump for not writing a post about Dave for his birthday. We were pretty busy that day and I have neglected the blog quite a bit. Dave turned 28 on the 6th. While he feels like an old man, I keep telling him and attempting to convince him that he’s not. Considering the years that we’ve been together, he’s accomplished much and achieved a lot of goals in a short amount of time. I’m so proud of him as a person. When we met, he didnt have an opinion on most things, and never really took the time to care about himself. He was always serving other people and making sure others were happy, at the expense of his own feelings. It was frustrating to watch how his family treated him and the lack of consideration they had for his opinions and desires. Its admirable to me how he’s able to always put himself second, but he has since learned that standing up for yourself and what you believe in, even if others don’t agree, is not selfish, but being true to who you are. He is insanely generous and thoughtful, and takes great care of me and the girls. He loves spending time with us and helping me teach the girls about life. I’m so amazed at the balance he’s able to strike between work, school, family, and our marriage. He supports me in everything and its refreshing to hear his view on life, our girls, and things in general, especially since I’m about the only one who ever gets to hear it. We are so different, but so much the same as well. I could not ask for someone better to buoy me up when things get crappy. He’s amazing. So, babe, Happy Belated Birthday. When we get the heck out of here, we’ll really party down k?! 😉 I love you so much. The girls are great too, if anyone is wondering! Charli is such a climber and my mom was astonished at how fast she is! The girl has no fear and loves to try and keep up with Tori. Tori is growing by leaps and bounds. Her eye condition has not changed at all, though her eyes thankfully have straightened out some on their own. We are due for another checkup in a few months with her. She has an extensive vocabulary and constantly amuses us with what she comes up with. She’s a great big sister and takes care of Charli. We hope everyone is well and appreciate all the thoughts, prayers, emails, comments, and wishes for our birthdays, as well as Dave’s application for the Master’s and our ongoing search to find our own place. Au Revoir! Yesterday we went to the “Zero Fatalities Safe Kids Fair“. Its basically a fun thing for kids to do to learn about being safe. Tori had a blast, got TONS of stuff, and they even had a few things for Charli! Babies ‘R’ Us was one of the sponsors and put on a “Diaper Derby”. 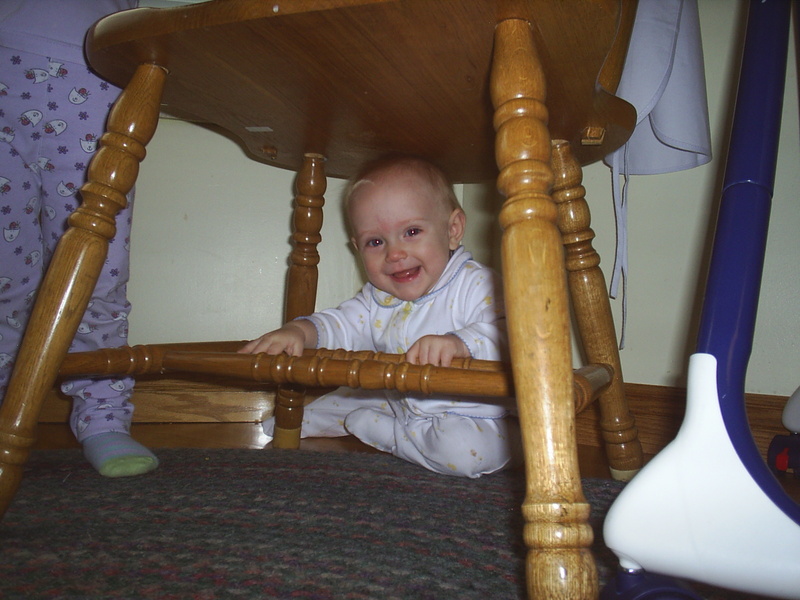 Little kids under 18 months could race, either crawling or walking, across the floor. So, we signed Charli up! They had 25 babies racing all together and they wered divided up into 5 seeds of 5 babies each racing together. Charli got 1st in her seed! Wooo hoooo! She was racing against 4 boys, so it was fairly humorous watching these little boys watch her go! Then, the top 5 babies raced together. The little boy that won 1st place was actually too old, so it was a little irritating cause his mom lied, but if she felt good about it, then thats great for them. They won a ton of stuff- a one month membership to gymboree and then everything else that 2nd, 3rd and 4th won as well! Charli got 4th, but in her defense, the stupid judge kept standing in her crawl path. He’d move and she’d stop and look up at him. It was really close between 2nd, 3rd, and 4th. Charli won a bunch of coupons for an organic baby food line, funny cause she HATES baby food! The best part for me though was Tori’s cheering. I was by myself with the girls, and every other person came with Grandma, Aunt, friend, etc etc… so, I had Tori sit at the other end and call Charli while she first started and after she got about half way down the mat I’d go to the other end with Tori and we’d scream for her to come! Tori had so much fun and she was so sweet. “C’mon Charli, go faster! You can do it! I love you Charli, C’MON CHARLI!!! !” It was so sweet. Dave’s siblings are all very supportive of Geoff(dave’s little brother, the baby of the family), and I admire that to a certain extent. My siblings were never very supportive of each other and I’m so glad that Tori is already getting a taste of what its like to be sincerely excited for your sibling. I can’t wait till Charli and I can go and cheer Tori on at soccer, or gymnastics, or dance, or whatever she wants to try. Growing up, we also weren’t in a lot of things. I played piano for a while, but the only sports I remember playing were softball and soccer- I played each for one year in the community and then a half a year of softball in middle school. Dave and I have decided that the girls can try whatever they want, and if they turn out to not like it, thats ok too. When Charli won, Tori was just elated. Jumping up and down telling her she won, and Charli just giggled away. 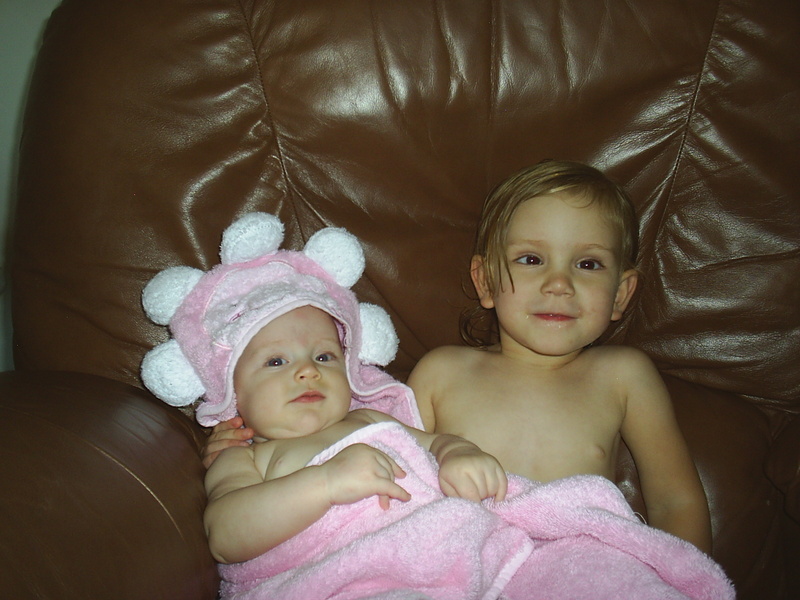 Again, I’m reminded of how lucky I am to have my sweet little girls. They are so much fun, and even though I feel I am on the edge of losing my mind most days, I wouldn’t have it any other way! Tomorrow(well today technically) we’re coming home. I’m excited, but at the same time, sad. Its been fun. Friday we did nothing all day and then went to Buffalo Wild Wings… not that great, but Dave has always wanted to try it… its a one time thing- or take out. Granny and Grandpa then took us to Sheridans for custard. Saturday we went and got the car washed(thanks grandpa!) and went to IN-N-OUT burger. Then onto shopping(YAY for the girls… I am addicted to shopping for them) at the outlets, Trader Joes, and Fresh ‘n’ Easy. The night ended up with games with Granny and Grandpa. Sunday… well Sunday was not like the rest. It was our family day. We had breakfast at Dunkin Donuts. As a kid I used to go here with my mom and siblings if we were good. They don’t have them in Utah, and I was really shocked at how gross they were! I remember them being amazing! After breakfast we stopped and got some flowers so we could go and visit my friend’s little boy, Jack, at the cemetary. He has a beautiful little headstone and it was precious to see Tori be so concerned about “Jacks”. Dave and I took a little time to reflect on how lucky and blessed we are that we have Charli and she’s alive and well, and how blessed we are with both of our sweet girls. It was sad to see so many little headstones in “The Garden of Innocence” but so precious to see the love and time spent there. One little grave even had solar panels, so that at night, the lights planted near the grave would light up. It was bittersweet. We are so happy to have our girls, but so sad for our friends, the Johansons. Long after we left, Tori was still concerned about Jack and if he was coming out of the ground soon, and when he was coming to play. When we left, she was on her phone saying, ‘No, Jack isnt coming, I’m sad”. After that, we stopped by the old “new house” that my family built from the dirt up. It was kinda sad. The people that live there now are CRAZY! She is a dog trainer(ok, he was REALLY nice…just a whacko wife) and no kidding- the room that was supposed to be my bedroom IS A ROOM FOR HER THREE DOGS! WITH A FLAT SCREEN TV AND THREE LITTLE BEDS! It was absurd. The floors are now a stained concrete. She keeps her barbecue and wood pile over the handprints in the concrete in the backyard. They’ve put a pool in. They put in fake grass, and the only real grass is disgusting and torn up from the dogs. They’ve built 4 dog runs as well. It’s insane! The whole time we were there those blasted dogs wouldnt quit scaring the crap out of Tori and Charli- jumping on them, licking them, barking, etc…. for a dog trainer, I can’t say I’m impressed! It was nuts- and another reason for me to hate dog owners that think that there ANIMAL is as important as a human being… sorry all you PETA lovers… I cannot stand animals! They are not equal to humans, and while I agree they should be treated humanely- they should not rule a human beings quarters… insanity. I guess the saddest part for me was that its like, these people have covered up our handprints- and yet everyday, the walk on the foundation we poured, the re-bar we tied, and all the other work we put into that house, and they don’t even think twice. After that, we visited some family, came home for dinner and went and visited some more family. I really miss my awesome cousins and aunts and uncles. That about rounds out our trip… here are some pictures! Charli and her crazy hair, in her favorite attire, and on granny’s kitchen floor! Charli in the hot tub! Tori, being spoiled- I think she roped them into letting her ride 3 of these! Spoiled again! The carousel at the outlet malls… the same one I rode on when I was a kid! Victoria and Charlotte visiting Jack. This is the small subdivision that the house is in. The very corner bedroom would have been mine… but now, its this lady’s DOGS’! The “3 girls” sleep in that room…with their flatscreen wall-mounted TV and DVD player. If you haven’t checked it out, I’ve added a picture of my Granny and Grandpa, to the previous post. There is more to come! I took a bunch of pictures of the scrapbook that Granny has put together that has pictures of me as a little kid! They’re not the best cause its a picture of a picture, but they’re pretty good… check back soon!